Every year in Q1, FINRA publishes a letter about its regulatory and exam priorities. On Thursday, CEO Richard Ketchum offered a preview for 2016. 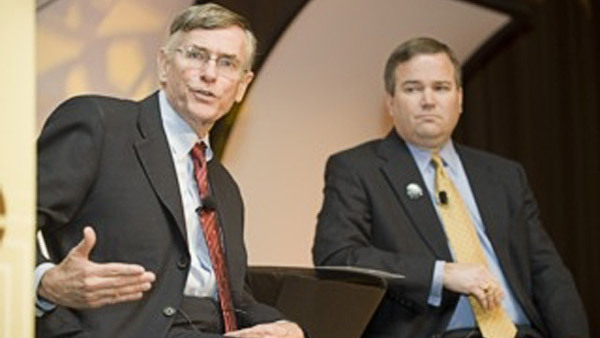 FINRA CEO Richard Ketchum, left, with Financial Services Institute CEO Dale Brown. Every year in the first quarter, the Financial Industry Regulatory Authority publishes an annual letter about its regulatory and examination priorities to highlight emerging and existing risks that could affect investors and the integrity of the financial markets. On Thursday FINRA Chairman and CEO Richard Ketchum offered a preview of the 2016 letter at the SIFMA/AICPA Financial Management Society Annual Conference held in New York. When asked by Attorney Ben A. Indek of Morgan Lewis about next year’s letter, Ketchum said that FINRA’s exam focus will focus on three key issues: outsourcing, cyber risk and liquidity concerns. On outsourcing, Ketchum said, “It’s entirely appropriate for firms to make those decisions … but those decisions have to made with supervision challenges absolutely top of mind.” He noted that this has been a focus for FINRA over a number of years and remains so. On cybersecurity, Ketchum said one key side issue from the exam standpoint was concerns about recordkeeping. “Firms have to insure that email records and other social social media records are maintained on unalterable forms.” He said FINRA found that firms are maintaining records, but a surprising number of them are not maintaining them in ways that are not subject to alterations. On liquidity risks, Ketchum said FINRA was particularly concerned with firms beneath the holding company level that that can potentially cause systemic risk or risk to client accounts. To that end, he recalled FINRA’s stress test of 43 firms earlier this year that focused on several potential stresses including repo positions, deposits with clearing firms and counterparties, funding for customer withdrawals and forced deleveraging. Thirty-seven firms passed the test. Six firms didn’t and are now under “heightened surveillance,” Ketchum said. He did not identify the firms, nor were they identified in mid-September when FINRA first released the stress test results. He expects FINRA will repeat “some version” of its stress test, possibly in a more structured effort in 2016. “This will certainly be an ongoing focus of FINRA,” Ketchum said. Ketchum also said that even though FINRA abandoned its Comprehensive Automated Risk Data System (CARDS) proposal earlier this year, which would have collected individual customer account data, it is not abandoning the idea of having more data to create an effective warning system.